Ok, I have started this article at least five times (first draft was on June 5th!). Five times of writing half (or less) of a review, then not liking what I put, feeling that it doesn't correctly convey the amazingness of Dawn of The Proto-Man. Because I am sick of seeing these articles sitting under my 'draft' tab, I am going to bite the bullet and piece what I have together. It might not make a whole lot of sense, as there are several different thoughts (and writing patterns for some reason) that I am trying to collect into one, but I have to get it done. If there is only one thing you get walking away from this article it needs to be this: Ogre is awesome, and Dawn of The Proto-Man is amazing; I knew from my first listen that this was something special. It's that kind of an album that you know will live on forever - a hard conjecture to make with an underground band, but I stand by it. The best way I can describe Ogre: a stoner/doom metal band with a singer that blends the vocals of the likes of Bon Scott (AC/DC), Ozzy Osbourne, Udo Dirkschneider (Accept, U.D.O. ), and James Hetfield (Metallica), whose main lyricist majored in English literature with a penchant for science fiction. It sounds like an eclectic description (which is is) and it sounds equally like a horrible and an awesome idea, but it's the best description I have, and it works amazingly. That is the best way I can put it. Even from my first listen I knew that this one was something special. 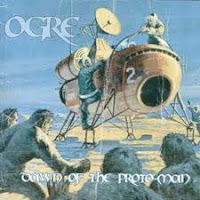 Ogre's debut album, Dawn of The Proto-Man, is an amazing piece of metal music - not just stoner, but metal as a whole - on par with anything Black Sabbath or anyone else ever put out. All of their songs are in some form of narrative, often in a very sci-fi way, filled to the brim with those groove-laden stoner sounds that I love so much. All of the songs on this album are fairly long, with the shortest being a little over five minutes and the longest, "Black Death," clocking in at almost twelve minutes in length. While some might think these long tracks would get boring or repetitive, Ogre keeps them interesting and fresh. All of the songs - and I mean all - have different 'sections' of the song, where either the tempo changes, the instrumental focus shifts, or there is a complete shift in the song style and composition. even though it happens in every song it's a really cool twist, every time. "The Jaded Beast" has an extended outro which is much lighter then the rest of the song; sort of a happy ending to a dreary tale. "Colossus" (my favorite song off the album) has a three minute groove breakdown/jam where the drums sound like they are pulling off a quarter note triplet beat, while the guitars go into a heavy 4/4 thrash riff. For this entire section the songs tempo speeds up drastically, moving from the doomy sound, before and after, into a thrash style; leading the mind to wander to the epic battle between man and machine is actually happening (as per they lyrics). By far my favorite track, "Colossus" is the harrowing tale of mixed point-of-views. The beginning verse is spoken as a omniscient narrator, telling of the Colossus' journey to Earth to save our race. Instead of being greeted as the savior it is, it's met by the war machines and fear. Earthlings attack the Colossus, which causes it to fight back. From the second verse on (well really from the chorus) the speaker changes to a general of Earth's armies, fighting the beast. In this fashion he tells how the Colossus kills and destroys everything they send at it, and it's invulnerability to nukes. The tale ends by the General realizing that the machine has discovered his bunker, and as he attempts to flee, the Colossus crushes him under it's heel. It's kind of an eerie tale to be sure, echoing numerous sci-fi stories that share the same premise. And while the story is grand, it's the music that adds to the greatness. While this song definitely falls into the stoner/doom category, it seems to tread the line into progressive metal as well. The main parts of the song (verse, chorus, etc. ), are all slow and methodical, while the several minute breakdown in the middle (filled with drum and guitar solos) is quick, funky and stylish. The song comes in at over 8 minutes, so it is kind of hard to diagnose this track within one genre or another. As you can tell by the length of this explanation, in comparison to the others, this track makes the album for me. If you only want to buy/download one song from Ogre, this one is it! The rest of the songs are equally deep and narrative; I could write a long paragraph about each and every one, but seeing as I don't want this article to become a book, I won't attempt it. The song "Ogre" is about a descendant of neanderthals who attacks a middle-age-era kingdom. It also contains a really cool beginning, where the starting thirty seconds is slow and doomy, then suddenly almost doubling the tempo into the quasi-thrash sounding first verse. "78" is the story many of us share, a man whose dream it was to be a rock star, but even now he's old and works a nine-to-five, he still goes home each night and practices his craft. Track four, "The Jaded Beast," is a song that flips subjects half way. The first two verses are about living in the ages where the East (China, Mongolia) were forces to be reckoned with. Where if you were alive during these ages the sound of fear always came Eastward. The final verse, however, switches it, saying that now 'The Jaded Beast' from the West has awoken, and their great walls cannot keep it out. Again a really interesting and deep narrative. "Skeletonized" is the most quintessential doom song of the album, at least in lyrical content. It's all about a woman going into the woods and dieing, and the maggots and bugs eating her flesh. It has no real story, just the repetitiveness of doom and death. Musically, it's on par with the rest of the album, but lyrically it is by far the darkest. Again, taking an interesting look story-wise, "Suicide Ride" is about a Kamikaze pilot during World War Two and his final seconds on Earth. Their last, and by far longest song, "Black Death," is about what you'd think: a pestilence creeping across the land, taking all with it. This is another musically interesting song, as it only has four verses (and no chorus per-se) but it clocks in over eleven minutes long. It also holds a breakdowns section which is in stark contrast with the rest of the song. this band is nothing but unique. Throughout all of these songs, Ed Cunningham's (the vocalist) style changes drastically. In the second paragraph I compared him to some of the other great singers of all time, switching wildly from type to type, and he does the same. Some songs his voice is light and semi-winy ("Colossus"), others it becomes dark and growly ("The Jaded Beast"), and still others it moves back and forth between those two, mixing in a third, more rock/alternative metal tinge (ala the James Hetfield comparison) with songs like "Ogre" and "Suicide Ride." It truly is remarkable how much voice this guy can pack in. Wow, this by far my longest article about one album, and it could have been probably three times as long if I had chosen to go into more detail about each song. If this review does not convince you that Ogre is a band worth trying out then I don't know what to do! Unfortunately the group's following two releases weren't up to par with this one, and they broke up soon after. I need to go back and re-listen to their other works to get a more accurate picture of the band as a whole. Dawn of The Proto-Man is an amazing display of musicianship, vocals, and skill - one of the best of the entire decade (this album coming out in 2003). I would love to have seen these guys live, but it cannot be (unless anyone hears of a reunion tour, if so TELL ME!!). The guitarist and bassist both went on to join Blood Farmers, but I can't find any info on where the lead singer went and that is the man I want see. Again, I cannot stress this enough, Dawn of The Proto-Man is one of the best albums I have ever heard; it has joined the ranks of Dream Theater's Scenes From A Memory, Pink Floyd's The Wall, Uriah Heep's Demons &amp; Wizards and Clutch's Blast Tyrant to round out my five favorite albums of all time. Listen to it!